Two examples of the growing and increasingly vocal discontent among Republican fiscal conservatives with this administration and the Republican Congress. Kate o'Beirne and Richard Lowry in their article "A Congress Gone to Pot" (May 22 issue of National Review) outlines a wide ranging litany of conservative discontent. While they allude to a lack of leadership on the part of GWB, the majority of their criticism is leveled at the Republican Congress, taking dead aim at the reactive vs proactive nature of this Congress, the silly gasoline price rebates, failed immigration policy, playing politics with national security, expanding and creating ineffective new bureaucracies, and - my favorite - complete abandonment of any pretense at limiting government or maintaining fiscal responsiblity. Overall federal spending is up 33 percent durng the majority's Deterioration phase, with defense and post 9/11 spending on domestic security representing less than half of this new spending." One does not have to look far to find other conservative voices that feel betrayed by the single party control that grips Washington. One of the most remarkable of these is Dr William Frey's "Republicans for Humility". Like me, he voted for George W. Bush in 2000, and subsequently became disenchanted. His motto of "Country before Party" and powerful intial essay "Confessions of a Repentant Republican" is a must read. "I supported George W. Bush in the presidential election in 2000, believing then that he best reflected my love for America and for our tradition of liberty. I supported the war in Afghanistan. In March of 2003, I believed that the invasion of Iraq was justified based upon pre-war revelations presented to Congress and to the American people. Accordingly, the indictments contained herein apply, first and foremost, to myself... For me, recognizing that I could no longer support the President for whom I voted, and the occupation of a land we had invaded, remains personally painful. I have learned that while it is difficult to admit being wrong, such recognition is a prerequisite for redemptive action, necessary both for individual growth and for the healing of our nation. It is in this spirit that I submit these reflections." - William Frey M.D. Years before I started this blog, Dr. Frey found the same Niskanen article and came to the same conclusion regarding divided government. "Conservatives have observed the paradox of Republican Congresses producing more conservative results under a Democratic president than under a Republican. ... political parties controlling both the presidency and Congress are under intense pressure to produce the appearance of progress, even if the long term consequences are detrimental to future generations of taxpayers. " With this in mind, conservatives with consequential differences with President Bush on matters related to foreign policy, the war in Iraq, the conduct of the war on terrorism, issues of civil liberties, the rule of law, and fiscal responsibility, are considering the benefits of divided government." Dr. Frey focuses on the President as the source of his concerns, while the NR article looks primarily at the Republican Congress. But like most disgruntled conservatives, both tend to see this specifically as a betrayal by the Republican Party. Consequently they see the solution in terms of fixing the Republican Party. I see this differently. The problem is bigger than the Republicans and focusing exclusively on the GOP will not solve it. The problem is inherent in the nature of the political process in Washington. Simply put, the seduction of power and its inevitable consequence of an overriding imperative to be reelected ultimately swamps all other considerations for the fallible humans holding public office. The perception of incumbents is that: Reelection requires money that only special interests can provide; Reelection requires pandering to polls over principle; Reelection requires cultivating local loyalty by bringing home the pork. I am sure most politicians rationalize the dirty job of securing the money, populist pandering and pork-barrel rolling as a necessary pre-conditon ultimately getting around to doing what is right for the country. The obvious problem is that the continuous reelection inspired compromises do far more damage than whatever good comes later. Long term these problems may be fixable by electoral reform, campaign reform, and electing better representatives. Operative words being "may be". There is a solution that disgruntled Republicans and conservatives can seize right now, in 2006, and have an immediate positive impact. 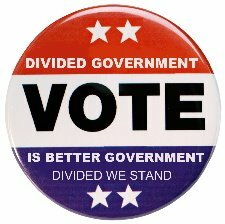 Although voting divided requires voting for democrats in 2006, it is not the same as voting for the Democratic party or Democratic party values. It is a way to vote tactically for the values of better governance, limited government and fiscal responsiblity through the well documented mechanism of divided government. It works.